Do Not Try To Do Everything Yourself. Do not be a martyr to the moving process, no-one will slap you on the back for your heroic efforts if you try to go it alone. Find a removals company to help you. As you are moving to the Canaries you will need one that can cope with a move to Europe. Leave Everything Until the Last Minute. Packing up your belongings is not a job for the night before the big move. Lists are your friend (as are packing boxes and labels). Get organised early on and leave plenty of time for this job (you always have more stuff in your home than you think), and the attic and shed are usually jam-packed too! You can ship as much or as little as you need to from a wardrobe full of coats to the full contents of your house (including the myriad of items in your old shed)! Hastily Choose a European Removals Company. You will need the assistance of a reputable European removals company. We offer a friendly and professional service and can look after any size move, no matter how big or small. We can help you and ensure your move to Fuerteventura from Dublin goes well. Check out the services we have on offer – these include courier service, pallet service, part load and full load services and even container shipments. 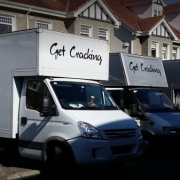 Experience is crucial when you are looking for a moving company to Spain, why not go with the proven expertise of Get Cracking? Call us today for a free quote.